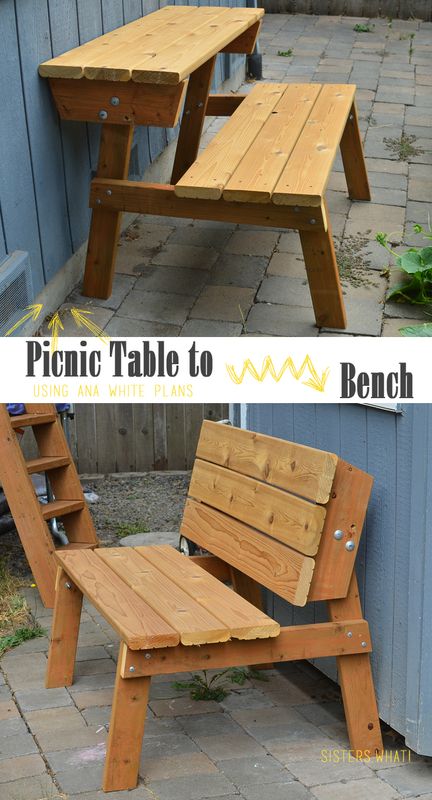 ' Turn a Picnic Table to Bench using Ana White Plans - Sisters, What! I love a good magic trick; especially the kind that eats away at me because I just can't figure out how on earth they did it. And these picnic tables are totally magic. First it's a table, and than bam (well 5 minutes later because it's not really a magic trick and requires grunt labor) it's a bench. Pretty awesome right? 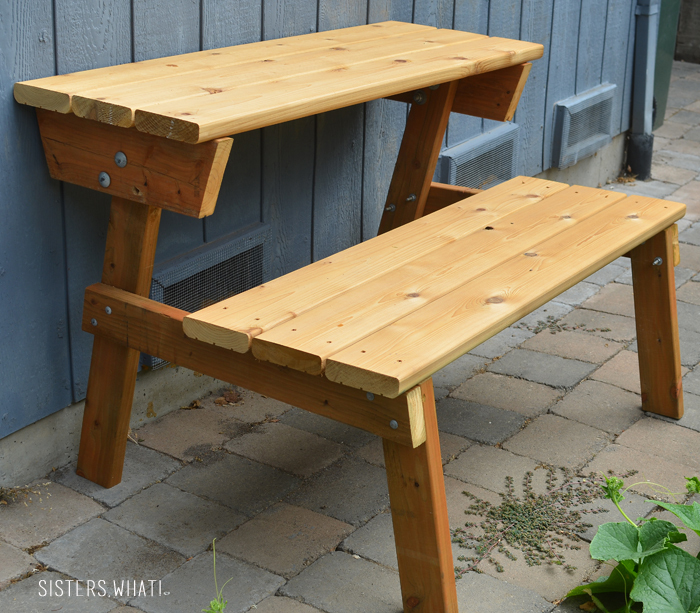 I saw these picnic table to benches ages ago on Ana White's website and as soon as we moved into our house 2 years ago, I wanted some. Well, it took 2 years of randomly leaving Ana Whites website up on my hubbys' computer and occasionally mentioning how cool and awesome it would be to have some (I might have mentioned that it was like a magic trick). He didn't buy it until this year when he gave in and decided it was a good idea. And folks, I love them. They aren't an easy thing to turn from table to bench (because there's a long nailish thing that holds table in place when it's a table), but we keep one as a table and one as a bench. But really, it is magic. 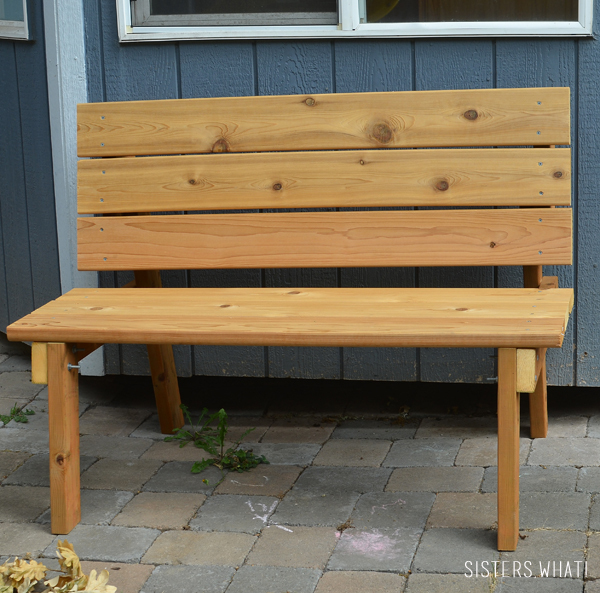 Now unlike Ana, we opted to use cedar instead of pine because we didn't want to paint them and wanted them to last longer. We haven't decided if we want to stain them or not. But, mostly likely it will be to late by the time we decide. And check out our squash plants as they take over the rest of the garden. Seriously, my poor carrots have been crushed. Yep, this is going on my to-do list! This would be perfect for my little girls. Love this! It's gorgeous! Thanks so much for linking up with our Living With Style Linky Party. Hope you'll join us again next week as well! Incredible table! 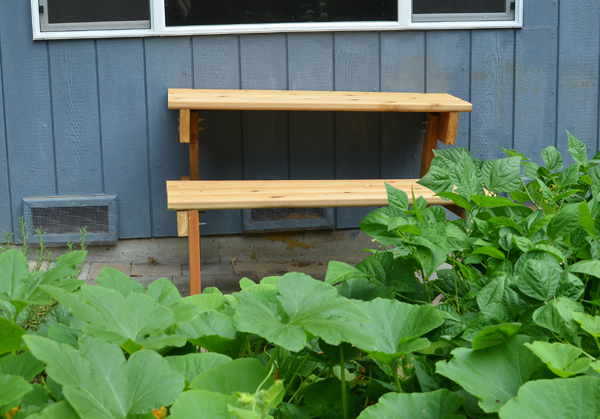 So neat that it can be a bench when it isn't in use as a table. It is a good thing your husband finally took the hint and made it :) I wish I could say the same about squash growing in my garden....I don't think I'll ever see anything actually growing on the little plants!